KININ Personal Aromatherapy Pens — Just Don't Call It a Vape! KININ Personal Aromatherapy Pens — Just Don’t Call It a Vape! I have a love/hate relationship with essential oils. I know they can be soothing and relaxing, but often when they’re run through a diffuser for a long period of time I get a headache. 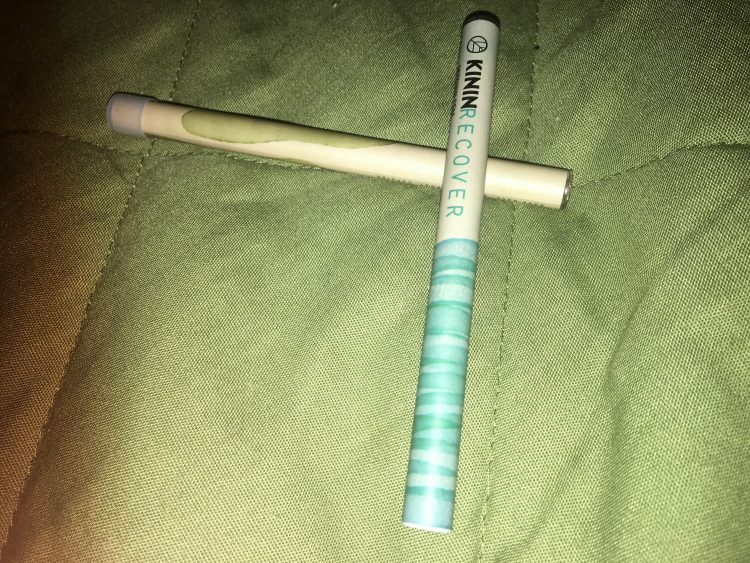 We were offered the chance to review the KININ personal aromatherapy pens, which have a different approach to aromatherapy, so I thought it was worth a shot! 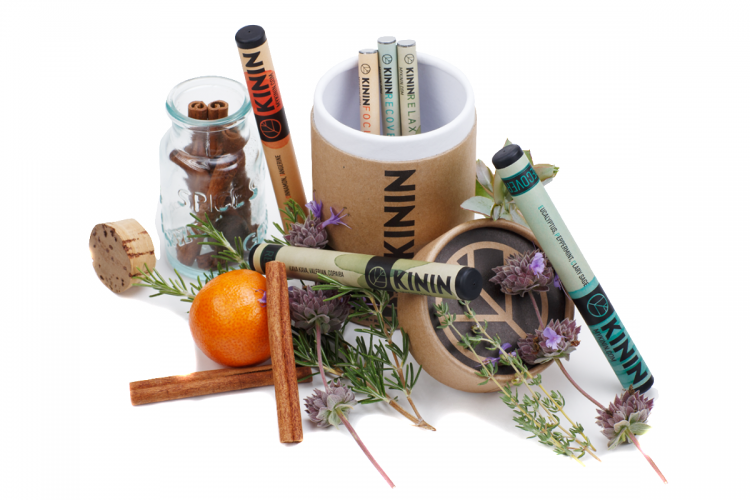 KININ products push the envelope by combining Ayurvedic breathing techniques with essential oil blends that are designed to help our customers focus more easily, relax, and recover from physical or environmental strain. We meticulously design and craft highly specialized vaporizable liquids that contain no addictive substances (nicotine or otherwise) and are designed to fit into today’s active lifestyles and busy schedules. There are three blends available now: Focus (nootropics [note that KININ does not say what these are made of], tangerine, and cinnamon), Relax (kava kava, valerian root, and copaiba), and Recovery (eucalyptus, peppermint, and clary sage). All of them are mixed with kosher vegetable glycerin, and while they don’t generate huge clouds of vapor, you may see some when you exhale. Focus was by far my least favorite, as the tangerine flavor was just too harsh for my taste; it also made everything taste like tangerines and cinnamon for a while. Relax was nice in small doses, but Recovery was downright delicious. It was my go-to during the review period, and I found it to be refreshing and soothing. The mint flavor wasn’t overpowering, but it was pleasant and left a nice lingering sensation behind. Now, did they work as intended? Focus left me jittery, but Relax did help me sleep, and Recovery seemed soothing enough. It’s very hard to say how much of this was a placebo effect and how much was the true effect of the essential oils, but I think there was definitely some impact. The forced breathing in through the mouth and out through the nose is also soothing and helpful, even without the diffuser/vape component, but the oils probably help too. Also, I really love that none of the smells lingered. It kept the scents from becoming too overpowering, plus it made the experience more discreet. I could diffuse/vape and not worry about it stinking up my room or car for hours. Of the three that were sent, I think I have reached for Recovery the most. It is soothing, and I’ve found that using it in the morning and at night seems to reduce my anxiety. However, I can’t say how much of that is from the oils and how much is simply the ritual of inhaling and exhaling. In pretty much every way. The only similarity is that a liquid is being vaporized. 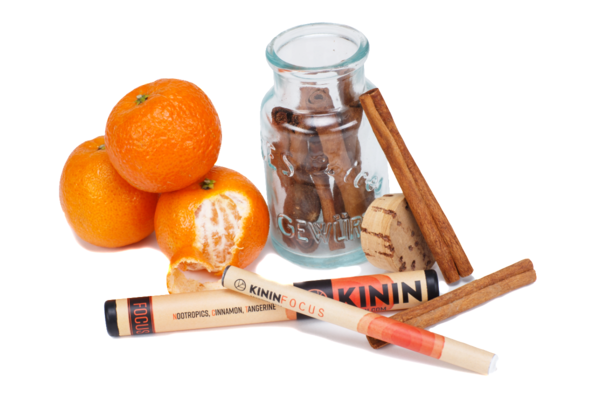 KININ products do not contain any nicotine, propylene glycol, or artificial flavors. They’re all natural. They claim the delivery method is the only similarity, but I don’t buy that. For one thing, they look like e-cigarettes. Also, the tip lights up when you inhale. Finally, you’re bringing a tubular object to your mouth, inhaling, and exhaling vapor. If it walks like a duck, talks like a duck, and smells like a duck … it’s probably not a bear. I am not well versed in the legalese of vaping, but I am willing to guess that regulations have a lot to do with this; anything vape-related has to be 18+, and is under a different level of scrutiny than a “personal essential oil diffuser”. 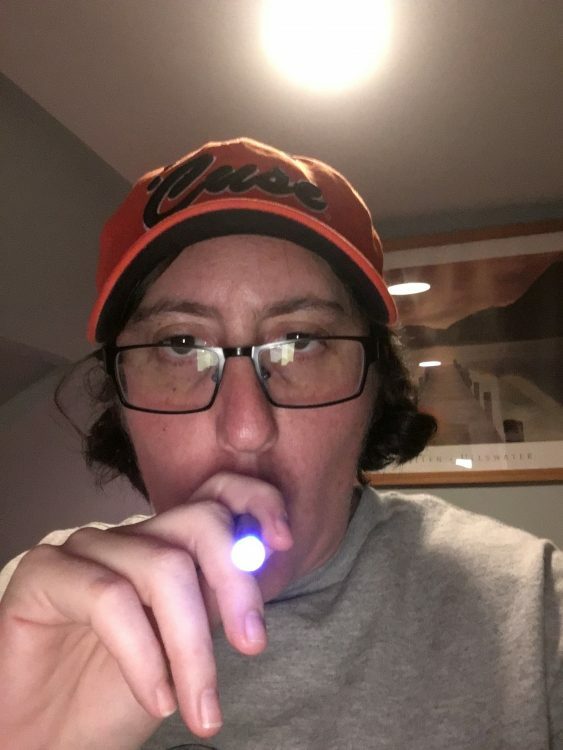 Still, I think the most telling part is this: I won’t use the KININ devices in front of my son because it looks far too much like I am smoking. Likewise, I highly doubt my office manager would be cool with me using KININ in my office, because, again, it looks like smoking. They say it is different and that might well be the case, but they made the choice to design it the same as a e-cigarette in size, dimensions, and style, it looks exactly like the disposable e-cigs sold in convenience stores and gas stations. As an analogy, this would be like me driving a Vespa down the highway. If I got pulled over without a motorcycle license, I would still get a ticket, even if I tried to argue a Vespa wasn’t the same as a motorcycle. That’s how I see the KININ — it’s not necessarily as powerful as a vape, but you can’t really claim with a straight face that it isn’t under the same category. KININ also claims their ingredients set them apart because they only use kosher vegetable glycerin and specially sourced oils. Cheap vape oils can contain controversial ingredients like propylene glycol. However, KININ isn’t unique in this respect. A very quick Google search led me to a number of higher end e-liquids that are just organic vegetable glycerin and one or two identifiable flavors (for example, Kind Juices sells e-liquid that only contains vegetable glycerin and flavor, plus they provide a third-party lab test proving there is not any Diacetyl or other dangerous contaminants). They are not essential oils, but in terms of a “cleaner” vapor, KININ isn’t completely unique. KININ is also pricey. One stick is $24, though that drops to $21.60 on “subscribe and save”. You can buy all three as a set for $60, or $54 on “subscribe and save”. That’s … not cheap, even though KININ says they can last around a month (or 250-300 breaths). A bottle of e-juice for a vape might run you about the same ~$25, plus the cost of the vape, but you get more flavor choices with a vape. On the other hand, KININ is one of very few companies selling inhalable essential oils, so if that is specifically what you want, well, you have no choice on the price. So this where the review leaves me feeling a little mixed. On the one hand, I genuinely enjoy using the product and found that it helped my mental well-being. On the other hand, I can’t rule out a placebo effect, or that the breathing is the key over the oils. Most importantly, I am deeply uncomfortable with calling this a “personal essential oil diffuser” — it is a device that vapes essential oils. KININ can try to argue there is a difference, but in terms of looks and functionality, it’s a vape.